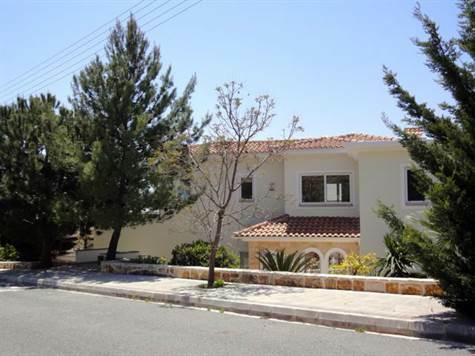 Cyprus Property Blog by Cleo : BARGAIN! HUGE Price Reduction on Custom Built Villa in Tala with Many Extras. Tala, Paphos - This luxury custom-built villa with stunning sea and mountain views is located in a prime location of the popular village of Tala, 10 minutes drive from Paphos Town and the International School of Paphos. The property has real style and is well designed with modern high quality finishes. A hallway from the entrance foyer leads to a self contained studio with private access including a large bedroom, kitchenette, shower room and outside terrace. Off the hallway is also a guest cloakroom and large storage room. Upstairs are two further bedroom suites, both featuring Juliet style balconies with fabulous sea and mountain views, closets with fitted wardrobes, and stylish en-suite bathrooms. The master suite also includes a small sitting room. Moving to the outside areas, the upper terrace is designed with pure luxury outdoor living in mind. The infinity pool is absolutely stunning and features waterfalls and large corner jacuzzi. At the side of the pool is an area for sunbathing and for outdoor entertaining there is a purpose built bbq area and covered terrace with superb sea and mountain views. Steps lead down from here to beautiful landscaped gardens with a lawned area and variety of shrubs and trees. There is further storage on this level. To the side of the property is a double width car port which can easily be converted into a full garage if required. Please refer to MLS #: 1344 when inquiring.